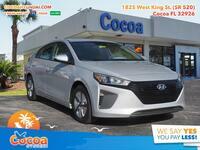 The Kona might be the most talked about vehicle on the lineup, but in our opinion the 2018 Hyundai Ioniq Hybrid is still one of the most exciting vehicles of the year. 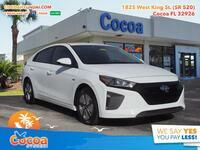 While it has been around a year longer, the Ioniq Hybrid showcases the future of the brand just as much as the Kona if not more so, thanks to its incredible hybrid technology and impressive fuel efficiency. We thought we’d see how the hybrid sedan measures up to one of its biggest competitors by pitting the 2018 Hyundai Ioniq Hybrid vs 2018 Ford Fusion Hybrid. We’ve compiled some of the most important specifications for a comparison like this into the table just below, but we’ll be sure to go through row by row to give you the details on how the two hybrid sedans compare to one another. Keep reading to find out more details! 26.5 cu. ft. Cargo Capacity 12.0 cu. ft. In the first and second row we looked at arguably the most important specifications in any hybrid vehicle: fuel efficiency (though you’d be hard pressed to find a specification more important in a hybrid). In the first row, we looked at how much fuel the two sedans burn through the city, and it became clear the Ioniq Hybrid is the better urban driver with an extra 14 miles per gallon. But heading onto the highway only got worse for the Fusion Hybrid, as that advantage increased for the Ioniq to 17 mpg. However, massive advantages like those two will obviously come with some repercussions, which appear in the third row. The Ford Fusion Hybrid fires back by offering 188 horsepower, which is nearly 50 HP more than the Ioniq Hybrid has to offer. So, if you’re interested in a reasonably efficiency hybrid sedan but don’t want to give up as much power, then perhaps the Ford sedan is for you. 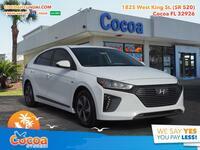 But if you want to get behind the wheel of one of if not they most fuel efficient vehicle on the market, even if it gives up some power to other hybrid sedans, then consider the Hyundai Ioniq. One more thing to make your decision easier pops up in the fourth row: cargo capacity. The Hyundai Ioniq Hybrid more than doubles the amount of space that the Ford Fusion Hybrid has to offer. That’s a huge different, and we think it makes the decision pretty clear.